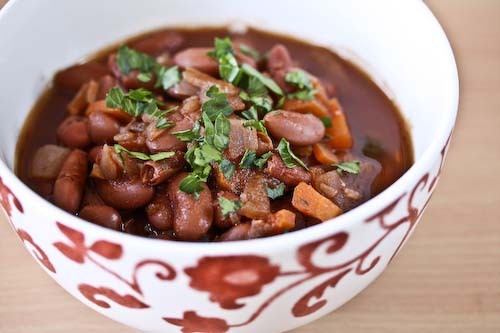 Combine the drained beans and 4 cups of fresh water in a pot over medium heat. Bring the water to a boil, reduce the heat, and simmer, partly covered, for one hour. I added a bit more water part way through so the mixture wouldn’t dry out. Warm the oil in a dutch oven over medium heat and cook the onion, carrot and celery, along with a pinch of salt, for about 5 minutes. Add the tomato paste, garlic and red pepper flakes and cook for 5 minutes more. Be sure to stir once in a while so nothing sticks. Add the wine, increase the heat, and bring the mixture to a boil. Add the vinegar and bay leaf, and finally the beans with their water. Tie a bouquet garni made up of the fresh herbs (see note) and add it to the pot. Also add any additional water necessary to barely cover the beans. Bring the mixture to a boil, then cover and place in the oven. Bake in the oven, covered, for 1.5 hours, then uncover for the last 1/2 hour. Remove the bouquet garni, and season with salt and pepper. Serve with minced parsley sprinkled over the top.